Used 2000 Jeep Cherokee Sold in Merriam KS 66203 Kansas City Autosport Inc. This Jeeps is literally the nicest XJ you will find. It is a trade in that we originally helped the customer find three years ago after a long search. 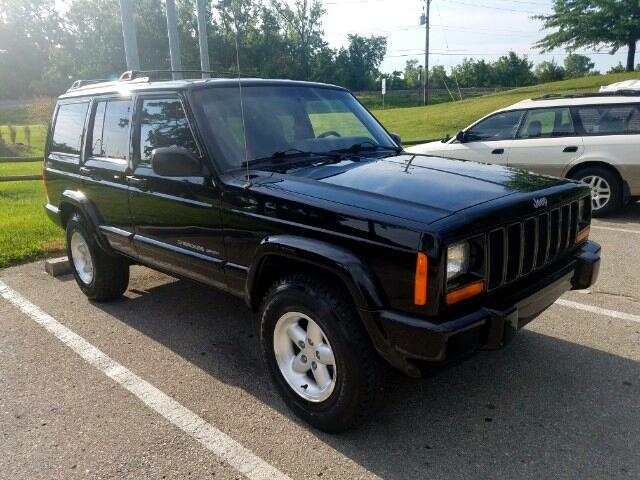 The customer originally wanted a Cherokee that they could make as perfect as possible and keep for a long time. Plans changed and they had to purchase a car for their teenage driver and decided they no longer needed this third vehicle. When it was purchased in 2014 it had around 91,000 miles on it. They knew they wanted a good car to start with and we finally found this one. Even though it looked amazing already, they chose to have it repainted and a complete new leather interior. The paint alone was almost $10,000. It was completely stripped and new emblems were replaced, all was done by a high end body shop. Other upgrades were the new head unit, Bilstein shocks, new wheels and tires. We also installed a new exhaust, back up camera, radiator hoses, coolant flush, brake flush, battery, new headliner, new dash pad (original had a small crack), floor mats, new carpet, new windshield, oil change and transmission service. All of this was done at the time they purchased the car. The customer has well over $30,000 invested into this Cherokee. The Jeep now has a little over 110,000 miles and still looks almost perfect. Visit Kansas City Autosport Inc. online at kcautosports.com to see more pictures of this vehicle or call us at 913-677-0707 today to schedule your test drive. Message: Thought you might be interested in this 2000 Jeep Cherokee.